For several years there was a piece of graffiti on a canal bridge about a mile north of Chester. It read: “Colours keep me alive.” I frequently passed it on walks into the city, and was always cheered by that existential cry from an anonymous heart. One day, officialdom vandalised the site with a bucket of whitewash. But I have always liked to think of the author of that graffiti somehow managing to keep the faith. 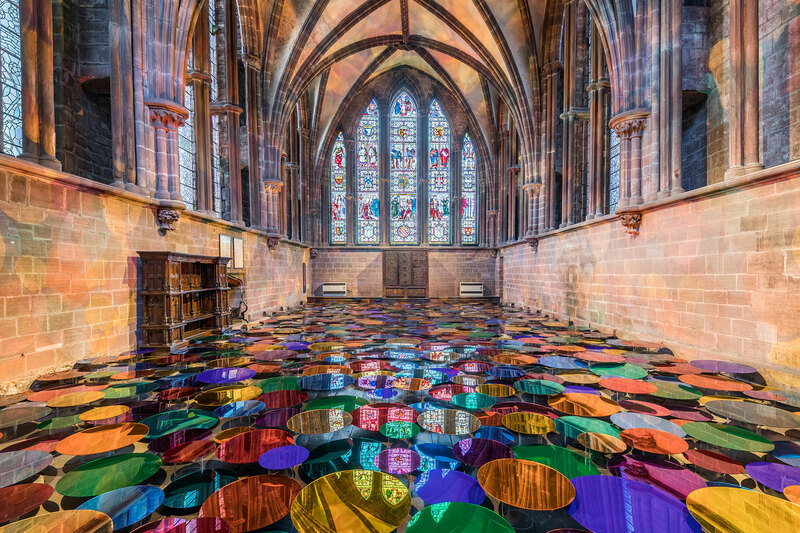 I also like to think that she or he has by now seen Liz West’s installation Our Colour Reflection currently on show in Chester Cathedral. They would realise that they had not cried in vain. Liz’s piece occupies the elegant Chapter House (built about 1250-60) with its rib-vaulted ceiling and its five soaring lancet windows on the east wall. 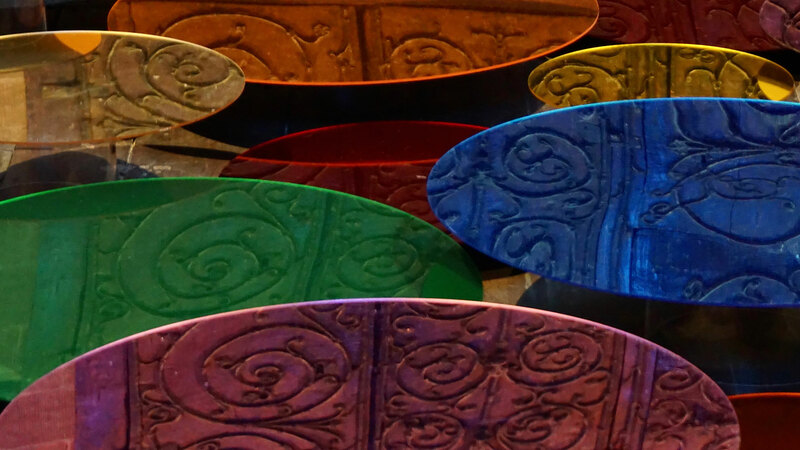 She has carpeted the entire floor in hundreds of coloured disks. 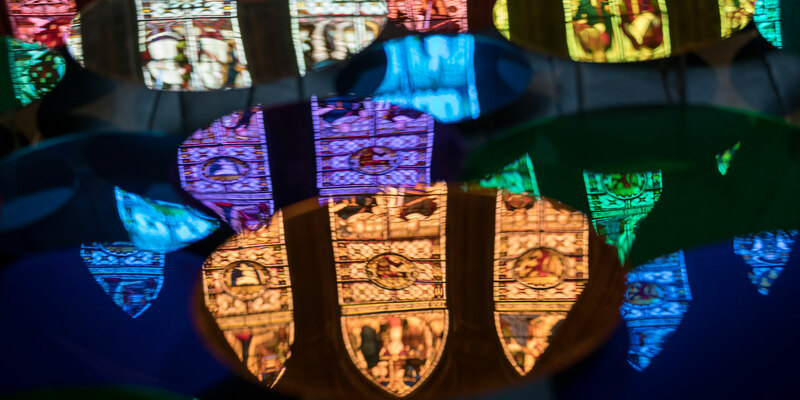 They bring their own distinctive colours and tones, but also mirror and reflect their 13th Century surroundings. The mediaeval building and the 21st Century artwork pay sincere tribute to one another and now cohabit harmoniously. They seem to call out to one another across eight centuries. Each brings its own art and craft, and then they join to co-create a fresh work of stunning originality. Churches and cathedrals might have been built to honour god, but in their conception and execution they reflect the creativity and industry of humankind. Liz West has seen the possibilities of such a setting. She brilliantly reminds us of our links to the mediaeval artists and crafts people who went before us. And indeed colour spills everywhere - spills and spreads and bounces joyously to the walls and ceiling vaults. Liz feels that this installation is particularly special for her in that it is entirely reliant upon its relationship with natural light sources. The scene changes constantly, sometimes from minute to minute. On the first day, with the weather dull and overcast, the colour reflections inside were cool and pale. On Day 2 the clear February sky led to vivid colours dappling the rejuvenated room. And so it has continued, each day and each viewing bringing fresh rewards and insights. On one occasion I let myself stare for some time across the sea of colour into the middle distance, and I was reminded of Monet’s water lilies. This is one of Liz West’s strengths: she has produced original contemporary work but seems aware of its place in a great tradition. It is as if she has been inspired by history and tradition, but has not been daunted by them. 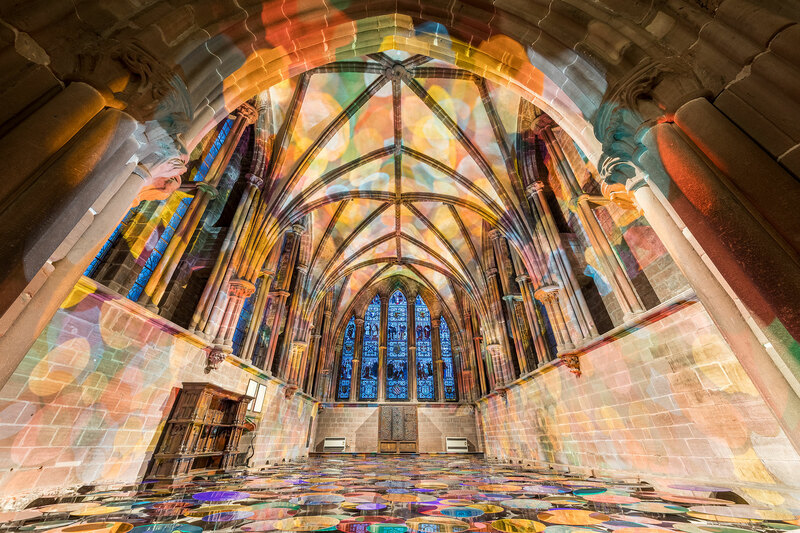 This is the latest project from Chester Visual Arts, an initiative generated by Ian and Cynthia Short who have committed themselves to bringing high quality art to the city of Chester. Long may it continue.